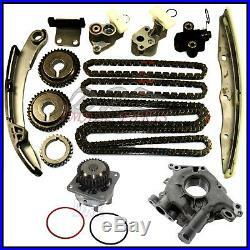 Timing Chain Kit, Water Pump, and Oil Pump Fits Nissan VQ35DE 3.5L V6 Engines. Timing Chain Kit With Sprockets, Oil Pump, and Water Pump. This Timing Chain Kit with Water and Oil Pumps fits Nissan VQ35DE 3.5L V6 Engines. Please note: This kit does not contain VVT sprockets. C720F, 9-720F, 13028-ZS70A, 13028-7Y000 (Engine Timing Chain). C721F, 9-721F, 13028-ZK01C, 13028-7Y010 (Engine Timing Chain, 2 included). 9-5592, 95592, 13091-7Y000, 13091-ZK00A (Engine Timing Chain Tensioner Guide). 9-5590, 95590, 13085-7Y010 (Engine Timing Chain Guide). 9-5593, 95593, 13085-7Y000 (Engine Timing Chain Guide). 9-5588, 95588, 13070-2Y511, 13070-2Y512 (Engine Timing Chain Tensioner). 9-5589, 95589, 13070-2Y501, 13070-2Y502 (Engine Timing Chain Tensioner). 9-5591, 95591, 13070-7Y000 (Engine Timing Chain Tensioner). S948T, S948T, 13024-7Y000, 13024-AL50A (Engine Timing Camshaft Sprocket, 2 included). S947, 13021-7Y000, 13021-AL500 (Engine Timing Crankshaft Sprocket). 1x Timing Chain (196 Links - Lower). 1x Crank Sprocket (26 Teeth). 1x Guide Rail (Tensioner Arm). 3.5L 3498CC V6 GAS DOHC Naturally Aspirated. Base Mini Passenger Van 4-Door. S Mini Passenger Van 4-Door. SE Mini Passenger Van 4-Door. SL Mini Passenger Van 4-Door. SL Special Edition Mini Passenger Van 4-Door. V6 GAS DOHC Naturally Aspirated. We will combine all orders when possible. It will also be e-mailed to you. On occasion there may be an error, either human or otherwise, with availability and we will inform you immediately if this happens. We usually respond within a few hours. We strive for 5-Star ratings and we will go out of our way to make you happy! The item "For Nissan Maxima Quest Altima 03-10 3.5 Timing Chain Kit Gears Water & Oil Pump" is in sale since Monday, October 30, 2017. This item is in the category "eBay Motors\Parts & Accessories\Car & Truck Parts\Engines & Components\Timing Components". The seller is "drzsmallparts" and is located in Lapeer, Michigan. This item can be shipped worldwide.